AFLW: 'Onwards and upwards' Watch as Collingwood AFLW midfielder/forward Alicia Eva gives her take on the Magpies' first competitive hit-out at the Holden Centre last Friday. Wayne Siekman will lead Collingwood's AFLW team in 2017 after a successful stint at the Vic Metro Youth Girls team. Photo: Robert Keeley. Collingwood coach Wayne Siekman is urging his AFL Women’s players to take the pressure that comes from representing one of the country’s biggest clubs in their stride. 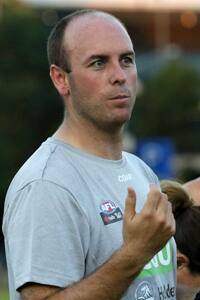 Siekman previously coached the Vic Metro youth girls side to multiple national championships and has worked with TAC Cup club Dandenong Stingrays in various coaching roles. He walks into Collingwood with an impressive resume and is well aware of the expectations that come with representing the club. "Collingwood fans want to win games of footy. They want to see an exciting brand of footy," Siekman said. "There's pressure (on all of us) because I want Collingwood members and supporters to continue watching because we're playing an exciting brand, and not turn off because we're playing poorly." The first hit-out: Watch highlights of our AFLW team in action. He said his players had increased their training standards during pre-season work, and knew they were under greater scrutiny than ever. "Now they've been given an opportunity, they're striving to do everything they can to be their best," Siekman said. "They know that every game's on TV, and you can't run around and look lost, or not know your role or what's required for your team. "They can't just cruise because they’ll get exposed, and not just by the coaching group and the club, but by the media and the fans." Siekman rattled off a list of players who stood out after the first phase of pre-season training – including Brittany Bonnici, Caitlyn Edwards, Sarah D'Arcy, Steph Chiocci and Alicia Eva – but reserved special praise for forward Jasmine Garner. "We knew she had all the talent in the world. Every team rated her quite highly, but she slipped down (in the draft) to the 80s, where we picked her up (at pick No.86)," he said. "She has the best pair of hands in the competition and she's an accurate kick. But the one thing that was letting her down was her fitness, which is what the other clubs wouldn't take a risk on. "We did, and she's done everything she needed to and has improved out of sight. Hopefully, we see the fruits of that – she's potentially a top-10 player – and I reckon a lot of clubs will see that and be a little bit disappointed they let her go." The Magpies take on Carlton in the first match of the NAB AFL Women’s competition, on February 3 at Olympic Park Oval in Melbourne, in what will be a historic occasion. "It's fantastic for our football club for a start, and then further to that, for our players to be in the first game of the women's competition," Siekman said. "It's even more special that 125 years ago, this club played Carlton in their first ever game (in the then-Victorian Football Association). Now, the women's competition is about to start and we're doing the same thing. "We know it'll be a good night."